Sri City, January 31, 2016:- M/s Khemka Containers Limited (KCL), one of the leading and largest companies in the Paper Printing and Packaging Industry in the country, held the ground breaking ceremony for its new production unit at Sri City, on Sunday. 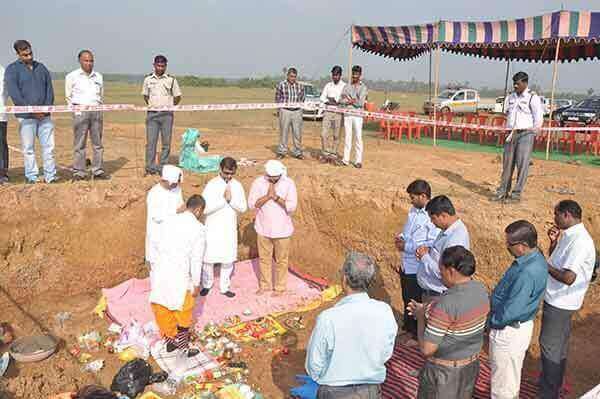 The Directors of the company Mr. Rajeev Khemka, Mr.Sanjay Khemka and Mr. Ashish Khemka performed the pooja and laid the foundation stone, signalling the commencement of construction. The company will set up the plant in a plot of 10 acres with an investment close to Rs.100 crores. It is planned to be completed by this October. The plant will produce corrugated boxes, mono cartons and printed display items.The factory would provide employment opportunity for about 200 people. KCL has for production units in the country. It serves almost the entire packaging requirements of MNCs and large Indian Companies in – Food, Consumer Durables, Home Appliances, FMCG Products, Engineering Goods, Automotive Components, etc., Cadbury, Pepsico, Tata, Godrej, Whirlpool etc., among several others, are KCL’s prominent clients.